The SIMPLIS Periodic Operating Point (POP) analysis excels at finding the steady-state ON-OFF limit cycle of a stable periodic switching system. Saving simulation time to identify errors early in the design process. Making AC analysis possible on a time-domain switching circuit. Takes a snapshot of every capacitor voltage and every inductor current at the beginning of each switching cycle. Simulates the system for an additional switching cycle, and then takes another snapshot of the system at the beginning of the next switching cycle. Takes the difference of each capacitor voltage and each inductor current between these two snapshots, seeking to drive each difference to zero. In practice, once POP has found the steady state of a switching system, the largest difference between two successive snapshot values for capacitor voltage or inductor current is in the range of 1.0e-10% to 1.0e-13%. These are miniscule errors compared to a typical RELTOL in SPICE of 1.0e-3. In a system with a reasonable set of initial conditions, the SIMPLIS POP algorithm iteratively seeks the following conditions to arrive at a steady state. For each capacitor voltage, the voltage difference from cycle to cycle is nearly zero. For each inductor current, the difference in current from cycle to cycle is nearly zero. Each logic device has the same state at the beginning of each switching cycle. Each controlled switch has the same state at the beginning of each switching cycle. Many of these systems use a feedback loop for control. If the system with its feedback loop is unstable and has no steady-state operating point, then the POP analysis will not be successful. As long as this feedback system is stable, the POP analysis can be successful. In real life, when you characterize a switching system such as a switching power supply, more than 95% of the measurements begin with the system in steady state operation. The SIMPLIS POP analysis quickly drives a switching circuit into a steady state. Once the system reaches steady state, the system can be disturbed and the resulting system response can be measured. In the majority of system measurements, the reference point for the measurement is the initial steady-state periodic operating point. Since in a typical design project, the designer runs several thousand simulations, being able to reduce the amount of CPU time required to get the system into steady state pays off in time saved for the engineer. If the time to reach steady state can be reduced from 10 minutes to 10 seconds, the time savings runs into hundreds of hours over the life of a project. 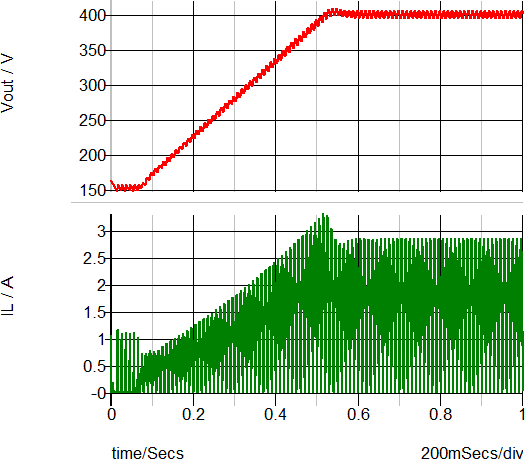 Because SIMPLIS can run so many simulations in a relatively short period of time, the SIMPLIS POP analysis makes serious simulation analysis feasible for switching power supply systems. Without POP, only a cursory set of simulation analyses can be run in the practical time allowed. POP, however, makes possible exhaustive system performance characterization during the design process. As a result, the majority of design errors can be detected very early in the design process. Detecting errors before the design has been committed to hardware means that the design errors are least expensive in time and money to correct. While performing a time-domain transient simulation with the system in steady state, an extremely small AC signal injected into the system assures that nothing disturbs the system in such a way that inadvertently saturates any device in the signal path. 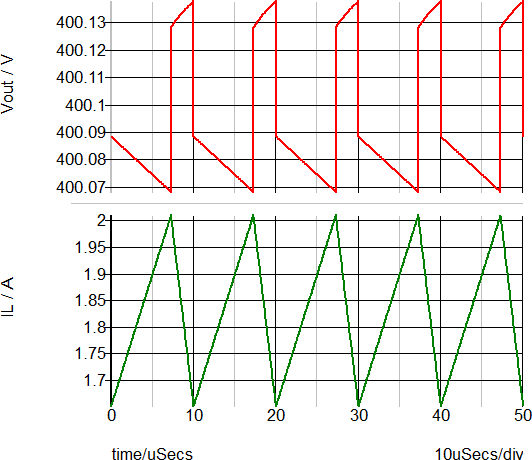 The system response to the injected signal is then measured again in the time domain. The accuracy of SIMPLIS is so high, that even with a very small injected AC signal, this system response can be measured with an extremely high signal-to-noise ratio. A Power Factor Corrector (PFC) converter dramatically shows the amount of time POP can save when simulating a converter to steady-state. Because this converter has a slow control loop response time, the transient simulation must be run for a long time to allow the converter to settle into steady-state. The POP analysis can reduce the time required to reach steady-state by orders of magnitude. A zip archive of the PFC converter schematics and supporting files can be downloaded here: simplis_500_pfc_examples.zip. The zip file contains four schematics which are identical, except for the analysis modes and the initial conditions. These models are larger than the SIMetrix/SIMPLIS Intro size restrictions. For an evaluation license for the full version of SIMetrix/SIMPLIS, contact SIMPLIS Technologies. The first simulation run on this converter is a SIMPLIS transient analysis, where the converter is simulated through a soft-start cycle and the output voltage is allowed to settle. The simulation stop time is set to 1s, which is long enough to allow the output voltage to settle after the soft-start is complete. After setting the initial conditions, the converter is simulated using the SIMPLIS transient analysis. This particular converter took 2 min., 28 seconds of elapsed time to reach the 1s simulation end time. The waveforms below show the output voltage tracks the soft-start ramp in a controlled manner, there is a small overshoot, then the converter settles into steady state with an output voltage of 400V. Most of the elapsed time is wasted in bringing the slow control loop to the final, steady-state values. The initial condition for the voltage loop compensation capacitor C2 is added to ensure the converter is in a switching state when the simulation starts. The POP analysis requires the circuit to continuously switch in a periodic manner, and without this initial condition, this particular model can stop switching, which causes POP to fail. The steady-state waveforms for the POP analysis are shown below. Note the output voltage has converged to a steady-state and there is no visible settling on the waveforms. This simulation only took 1 second to complete, compared to the transient example which took 2min., 28 seconds. One of the greatest rewards for designing a converter model which succeeds in SIMPLIS POP analysis is the ability to run an AC analysis directly on the transient model . There is no need to derive a AC model for the topology under study as SIMPLIS provides the AC response for the time-domain circuit model. The overall loop gain of the PFC converter is shown below. This simulation took 1second to run after a successful POP analysis. A summary of the elapsed time to reach steady-state for each DC Input Analysis mode is shown in the table below. The example zip file simplis_500_pfc_examples.zip contains two schematics configured for an AC line input. 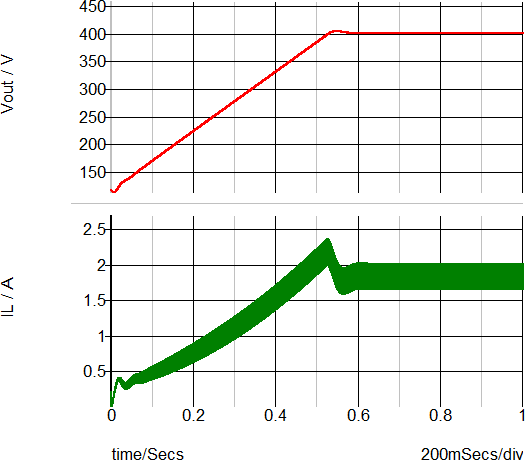 One schematic ( simplis_500_pfc_ac_input_tran_example.sxsch ) is configured to run the transient analysis, and the other ( simplis_500_pfc_ac_input_pop_ac_example.sxsch ) for a POP analysis. 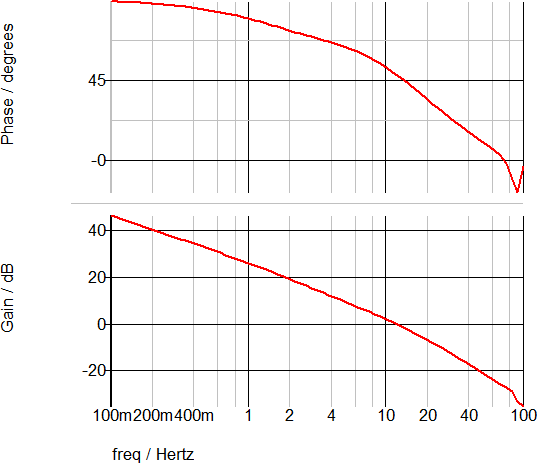 The switching frequency is an exact harmonic multiple of the input line frequency. The circuit has a reasonably close set of initial conditions. The POP trigger source is the AC line source. If these requirements are met, the POP analysis will be successful and the resulting AC analysis can be run on the model. 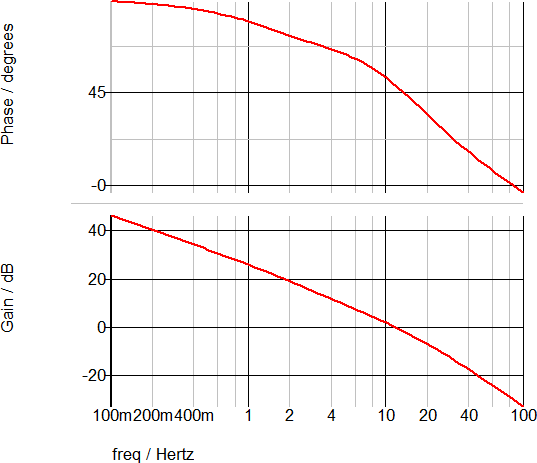 In the circuit examples, the first condition is met by choosing the line frequency to be 50Hz. The switching frequency is 100kHz, which is effectively the 2000th harmonic of the line frequency. Because the POP trigger frequency is 2000 times lower than the DC input case, the simulations with an AC input source take considerably longer to complete than the DC input case. Even so, the POP analysis is faster than the transient ( on either AC or DC inputs ) and, after the POP analysis is successful, the SIMPLIS AC analysis can be performed on the converter model, with an AC input line. As with the DC input case, the major energy storage elements are initialized. After setting the initial conditions, the converter is simulated using the SIMPLIS Transient analysis. This particular converter took 2 min., 18 seconds of elapsed time to reach the 1s simulation end time. The waveforms below show the output voltage tracks the soft-start ramp in a controlled manner, there is a small overshoot, then the converter settles into steady state with an output voltage of 400V. Most of the elapsed time is wasted in bringing the slow control loop to the final, steady-state values. The steady-state waveforms for the POP analysis are shown below. Note that instead of POP using the switching frequency as the POP trigger, the AC line frequency is used. As with the DC input case, the output voltage has converged to a steady-state and there is no visible settling on the waveforms. This simulation only took 43 seconds to complete, compared to the transient simulation on the same model, which took 2min., 18 seconds. The overall loop gain of the PFC converter operating under AC line input is shown below. This simulation took 1 min., 46 seconds to run after a successful POP analysis. 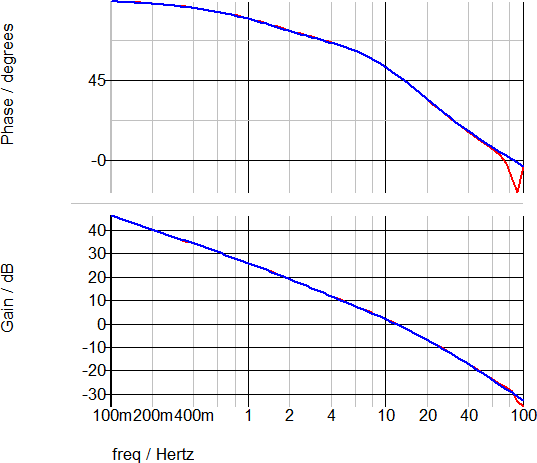 Note that this simulation time is much longer than the DC input case because the converter is using the line frequency of 50Hz as the POP trigger source. 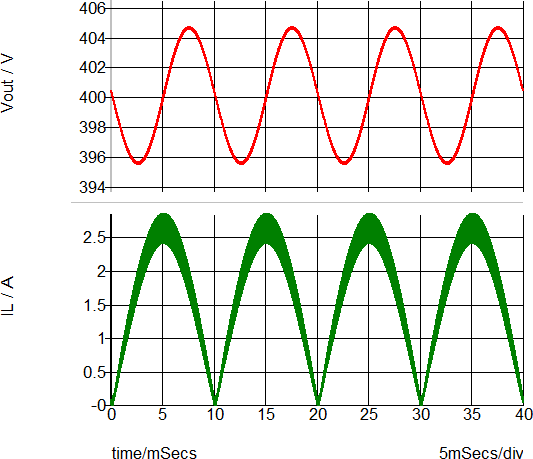 The AC Analysis results for a DC and an AC line source are nearly identical. A summary of the total elapsed time to reach steady-state for each line source type and analysis mode are shown in the table below.